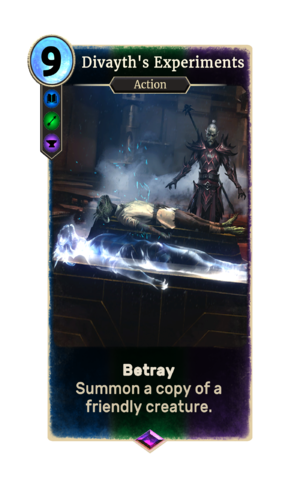 Divayth's Experiments is an epic House Telvanni action card. It is part of the Houses of Morrowind expansion. In addition to the card's availability in the Houses of Morrowind expansion, one copy is included in the Telvanni Ambition theme deck. This card depicts Divayth Fyr, who first appeared in Morrowind. He also appeared in The Elder Scrolls Online.